This blog post is for whose who are curious about the internals of Intel SGX SDK and interesting about applied cryptography. Matching of file name: When opening an existing file, the metadata of the to-be-openned file will be checked to ensure that the name of the file when created is the same as the name given to the open operation. The APIs should look quite familiar, even to entry-level C programmers, as most of these APIs have the same semantics as their counterparts in C standard library. The APIs with suffix _auto_key are related to using and managing automatic keys, which free the users from specifying a key explicitly. Automatic keys are derived from the enclave sealing key. Please see Intel documents for more information. The rest of this blog post is dedicated to explaining how SGX Protected File System works behind the scene. In SGX Protected File System, a variant of Merkle Hash Tree is used to protect both confidentiality and integrity of data. A Merkle Hash Tree (MHT), as defined in Wikipedia, is “a tree in which every leaf node is labelled with the hash of a data block and every non-leaf node is labelled with the cryptographic hash of the labels of its child nodes”. 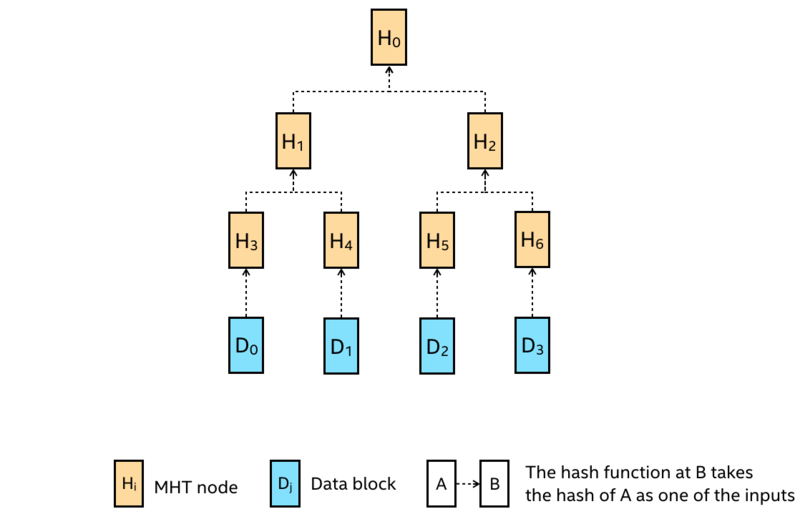 The core idea of MHT is that by organising the hash values in a tree, the integrity of a data block can be checked in a complexity of log(N), where N is the number of nodes in the tree.The figure below shows a classic MHT that consists of 7 MHT nodes that covers 4 data blocks. 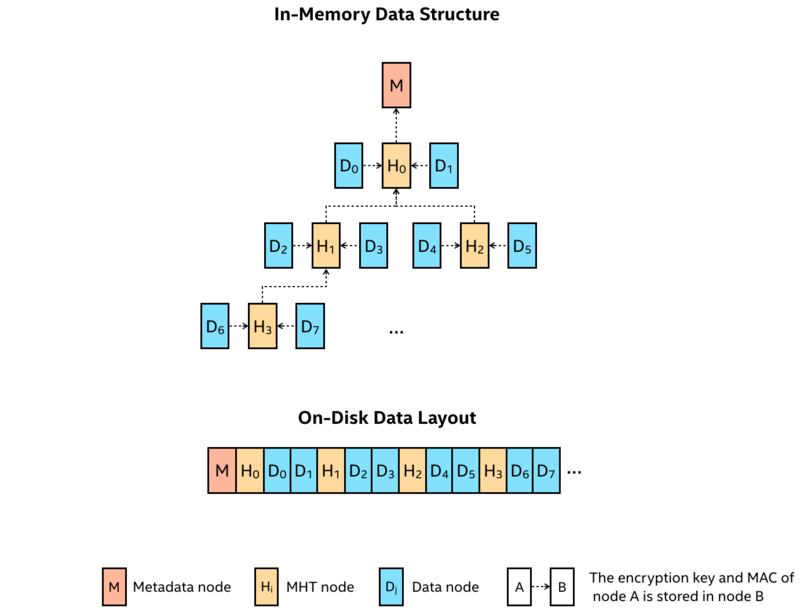 While the idea of MHT is simple enough, there are other considerations when implementing a MHT-like cryptographic construct for SGX Protected File System. First, the integrity protection provided by MHT must be combined with the confidentiality protection provided by some encryption scheme in an efficient way. Second, user data as well as the associated cryptographic materials (e.g., keys and MACs) should be organised in blocks (usually 4KB), which is the granularity of data management in file systems. Authenticated encryption. To protect both confidentiality and integrity, it is more efficient to use authenticated encryption—a form of encryption which simultaneously provides confidentiality, integrity—rather than doing encryption and MAC separately. AES-GCM scheme, widely accepted for its high throughput, is used in the implementation of SGX Protected File System. The metadata node maintains the file name as well as the encryption key and MAC of the root MHT node (H0). In addition, to reduce the disk space consumption for small files, the metadata node also contains the first 3KB of user data. A MHT node stores the encryption keys and MACs of its child nodes. A data node stores one block of user data. Easy-to-append layout. In a classic MHT, data nodes are only linked to leaf MHT nodes; yet, in this variant of MHT, data nodes are linked to leaf MHT nodes as well as non-leaf MHT nodes. This makes changes to the tree trivial when appending new data to the end of file. Another benefit is that the on-disk offsets of nodes can be determined easily. Now that we understand the in-memory data structure and on-disk data layout of the MHT variant used in SGX Protected File System, let’s examine the I/O operations. Reads and writes on a SGX-protected file (see the pseudocode below) are broken down into multiple memory copies from or to the plaintext buffers of node objects, which are acquired from a LRU (Least Recently Used) cache maintained for the SGX-protected file. Thanks to this cache, the implementation does not need to perform log(N) disk reads/writes for each and every read/write operations, where N is the number of nodes in the tree. To acquire a node object from the cache, we first check whether the node already exists in the cache. If so, then we are done; otherwise, we have to read the data of the requested node from the disk (via OCall) or simply initialise an all-zero buffer depending upon whether the node has been written to disk before. In addition, we have to recursively acquire the parent of the requested node from the cache. Nodes get evicted from the cache only when the cache reaches a high-water mark. If the to-be-evicted nodes are dirty (i.e., they have been modified after loaded into cache), then their data must be flushed to disk. When flushing the data of a dirty node to disk, we re-encrypt the data of the node and calculate its MAC with this new key. Then, the new key and MAC of the node is recorded in its parent, which will be flushed to disk later. This is why these dirty nodes are sorted before the flush actually begins. This way, we ensure that that all modified user data and their associated keys and MACs are re-encrypted and written back to disk. What happens if the program crashes in the middle of flushing? The data on disk must be left inconsistent, causing integrity check failure when the file is opened next time. To resolve this issue, before committing any modification to disk, the flush procedure creates a recovery file, which records the previous version of all dirty nodes. This information is enough to restore the file back to consistency if any crash occurs. In this blog post, I give a brief introduction to SGX Protected File System and then show in a high level how it works by describing its MHT-based data structures and I/O operations with a LRU cache. Limited concurrency. At any time, only a single writer enclave or multiple reader enclaves can open a SGX-protected file; that is, multiple writer enclaves could corrupt a SGX-protected file when accessing the file concurrently. Rollback attacks. The users cannot detect whether he has opened an old (but authenticated) version of a file. In other words, SGX Protected File System does not guarantee the freshness of user data. Side-channel attacks. Some seemingly-insignificant information, such as file name, file size, access time, access pattern (e.g., which blocks are read/written), etc, are not protected. This information could be used by sophisticated attackers to gain sensitive information.